Ideally situated in Seminyak’s Laksmana estate, an exclusive enclave of luxury private villas just minutes from the beach, lies the charming four-bedroomed Villa Jemma. The villa is wonderfully light and airy thanks to the spacious, double-height lounge and dining room whose wide glass doors open on to a stunning tropical garden, 16-metre swimming pool and huge relaxation bale on one side and a cool courtyard on the other. Three elegant double bedrooms with gorgeous garden bathrooms, and a fourth (twin) bedroom, which doubles as an air-conditioned study/TV room, await guests at Villa Jemma, as does an excellent staff team that includes a skilled chef. Master bedroom: A flight of white steps at one end of the living area leads up to Villa Jemma’s air-conditioned master bedroom which features a king-size bed, satellite television and DVD player, and enormous semi-open-air ensuite bathroom with a large tub and rain shower. Outside the bedroom is a covered private balcony with outdoor seating surrounded by lush greenery. Guest bedrooms: Two of the ground floor guest bedrooms are located on either side of the lounge, opening onto the garden and pool. Both feature king-size beds, satellite televisions and DVD players, and large open-air ensuite bathrooms with tubs and rain showers. Villa Jemma’s fourth bedroom is furnished with twin beds (can be joined to form a king), making it ideal for kids or for friends sharing. This room can also double as a study/TV room and has an adjacent bathroom with outdoor shower. 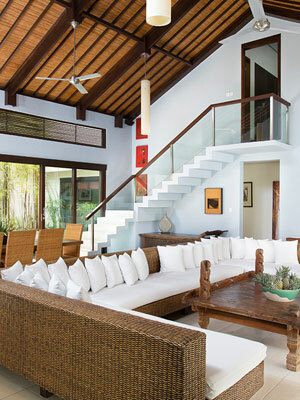 A bright, airy, and very spacious living and dining area forms the hub of this warm and welcoming villa. The room features a double-height, traditional pitched roof, is cooled by ceiling fans, and decorated with contemporary artworks. An enormous U-shaped rattan sofa faces the pool and garden and an eight-seater dining table lies just behind. Glass doors on both sides slide back to create a delightful indoor/outdoor tropical living space. On the opposite side of the pool, a comfortable thatched bale has ample seating for six and makes a delightful space to relax, and a pretty walled courtyard just beyond the dining area is a great place to enjoy an early morning breakfast or afternoon tea.